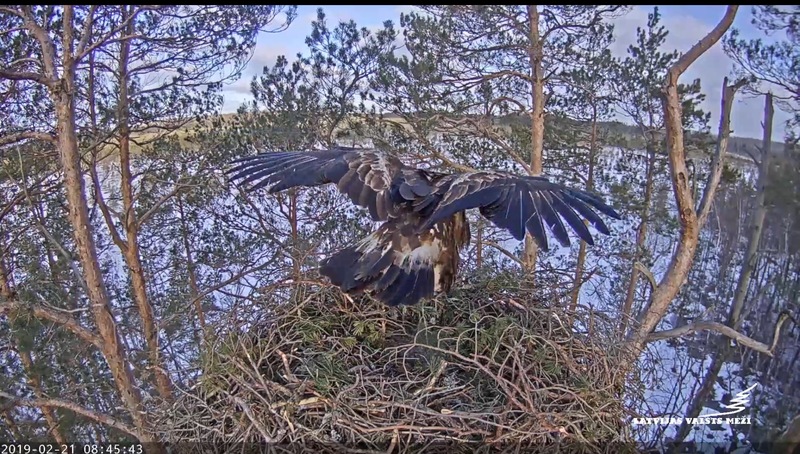 Latvia 2019 - Ospreys Nest Forum - The Place To Be! It is an artificial nest built by Uģis Bergmanis in the swamp on the island in 2010. 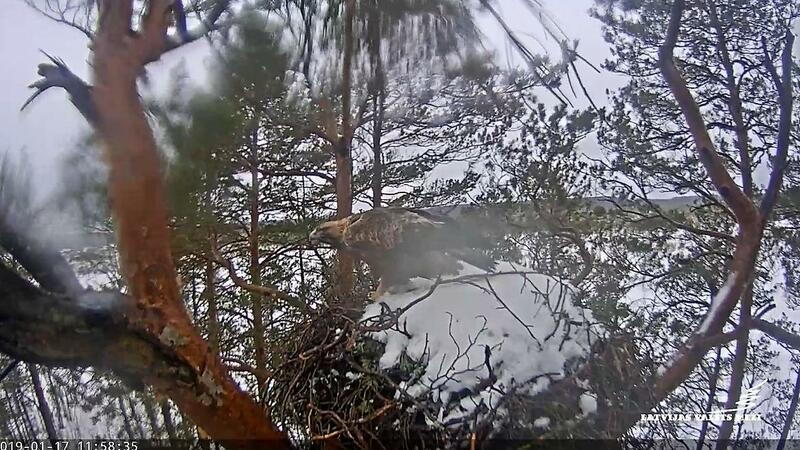 The nest has been inhabited on a regular basis, and a new rock eagle grew up in 2016 as well. The impression is that this year, there is only one adult bird in the nest area, which rarely enters the nest and hangs the branches. 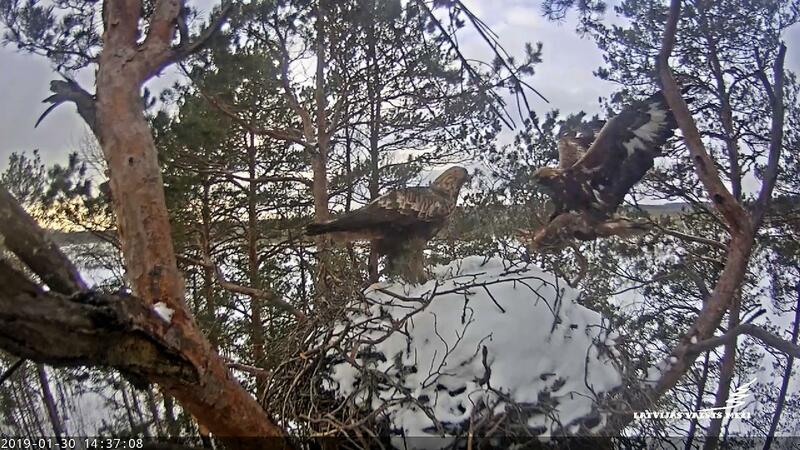 This year, the nest will not be successful, but it has good audibility, and in the mornings a grouse is heard. 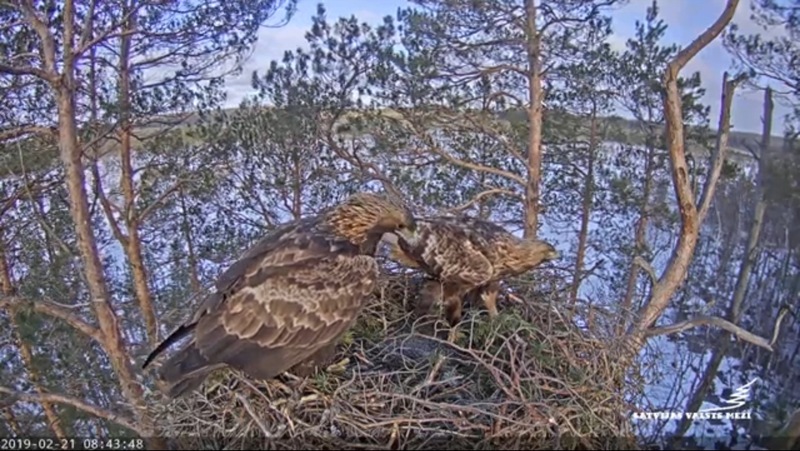 At the end of 2018, two eagles were found in the nest: we already know a male who has been living in this nest for several years and a ringed female. * About this ringed bird. 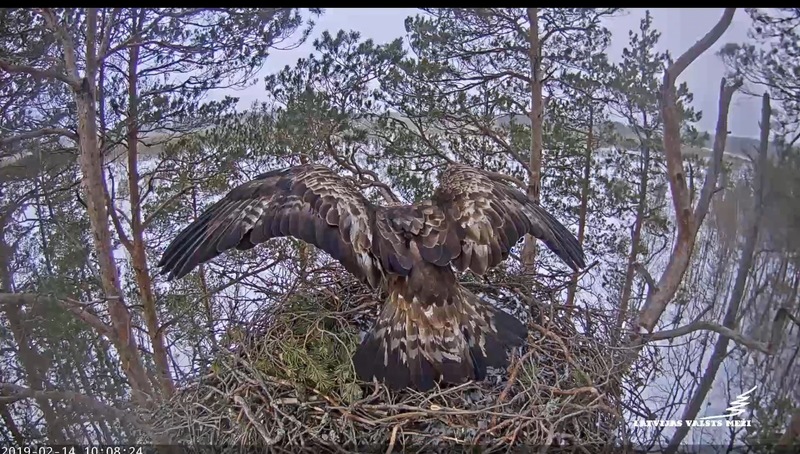 The guy has the belief that the ring on the left leg is red, so he is the bird of 2014 , because this year all the rock eagles were ringed with such rings, so in the next season they are already sexually mature. And 90% of the belief that the right leg has a white ring, which is what makes Finland. Already in the spring, when we fixed these rings in the nest, he sent information to Finnish ornithologists, but unfortunately the answers were still not received. Hieno päivä makojen pesällä, lumitöitä tehty ja oksia tuotu pesälle, ja mikä parasta, kaksi kotkaa pesällä !! Valitettavasti juuri parhaasen katseluaikaan yhteys meni poikki, kun toinen lennähti kameran päälle .ääniä kyllä kuului pitkään ..
Ugis käy kuulemma loppuviikolla korjaushommissa. Good evening, Watchers! Events in the nest show that the eagles have chosen this nest for nesting, and if this year there will be nesting, then in this nest. 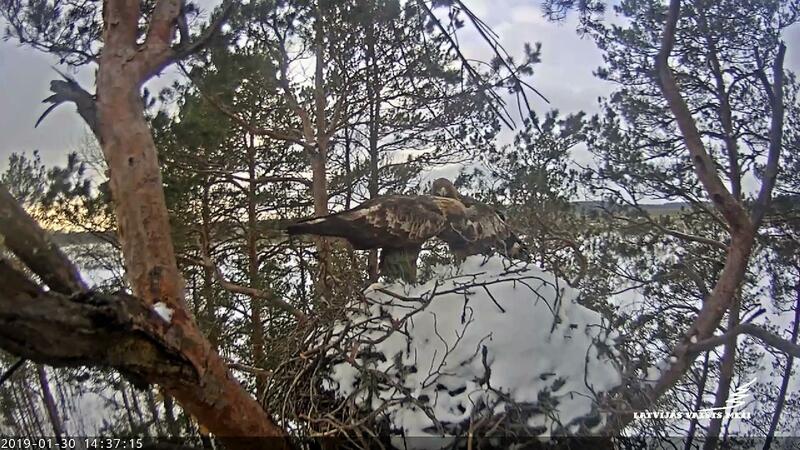 Judging by the regular stay of the two eagles in the nest until afternoon, there must be a well-stocked pile of fresh pine branches. With maximum caution, tomorrow in the afternoon we will hide in the bog with a calculation to get the nests to the darkness of the island. The sensor change will start at 18:00. 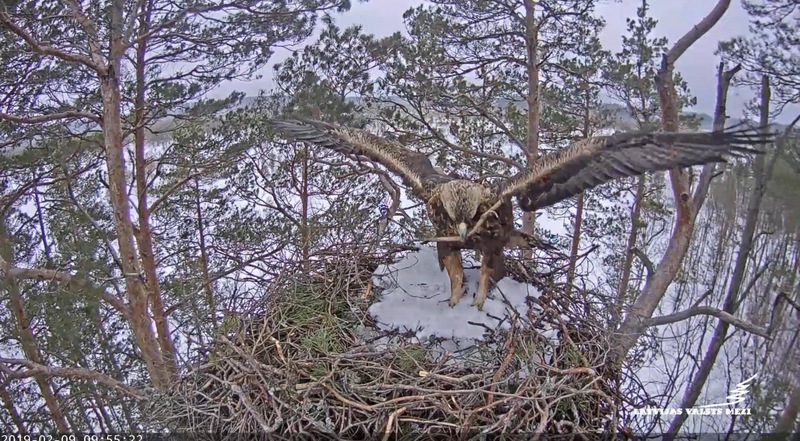 I still can't tell you how it will work, but it is clear that the sensor will be installed in a place that is more difficult to access by eagles. 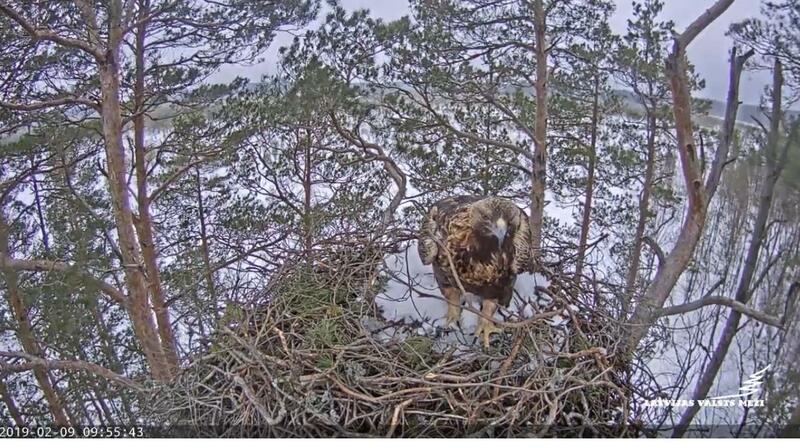 It also means that the view of the nest will be different and the nest will be closer. Keep your fingers out to make it work and to keep the power camera running until 8:00 pm tomorrow, so I can install everything. In any case, lively events are expected in the nest. Good luck watching and great thanks for the observations !! Melkoinen urakka pimeässä pesäpuussa. Kotisohvalla ei aina tule ajateltua kuinka suuren työn takana ja tiettömien taipaleiden takana maastossa kamerat ovat. "Kameran optisen anturin vaihtaminen" kertoi google kääntäjä tallenteen lopussa. Nyt se toimii. Maakotkakemrakin toimii mutta sirklaa usein. Komistus viivähti hetken pesällä ja lennähti senjälkeen lähioksille ja siellä huuteli kjak kjak kjak.. useita kertoja. Hello, Watchers! As I explained earlier, the camera will run until 09:00 to 11:00 until sunny days. 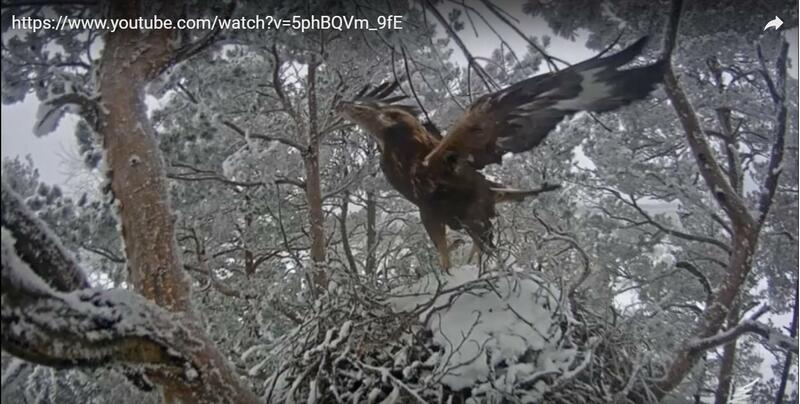 A brief summary of last year's events - In spring and autumn 2018, the nest was periodically visited by a rocky eagle with a red-blue ring on the left leg, and a male Virsis nest regularly. 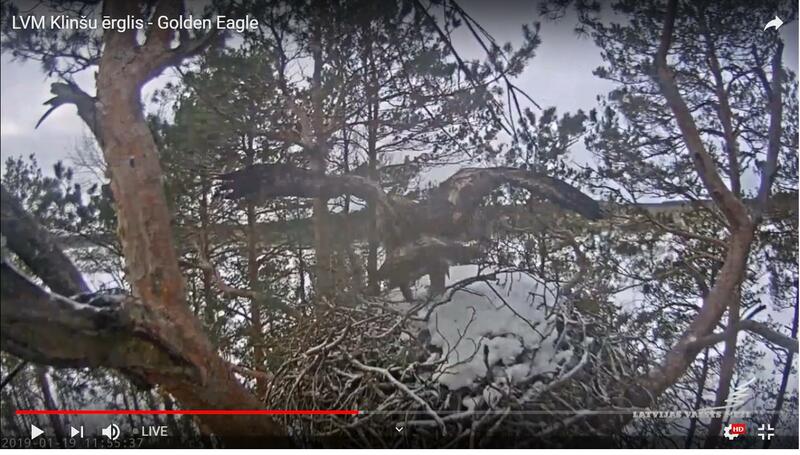 On January 30, 2019, the uninhabited female (white squares on the tails and on the wings) arrived in the nest without rings and replaced the camera sensor. The camera was restored in the evening of February 2. 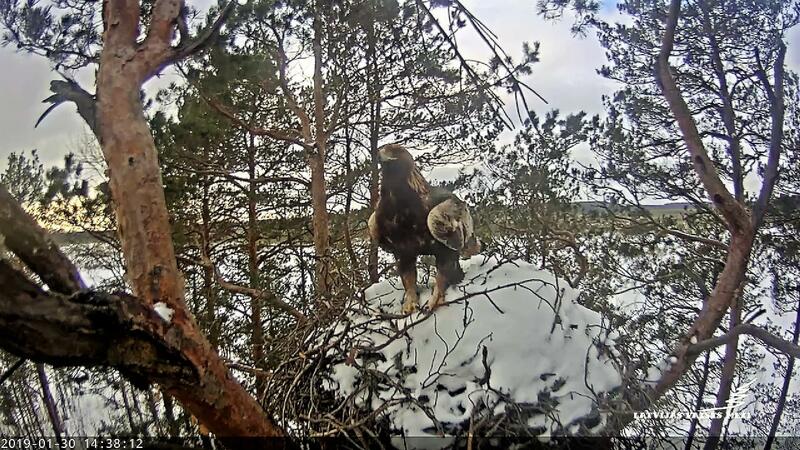 Since then, only the male has regularly visited the nest. Copulation is expected in the second half of February, on the first sunny days. 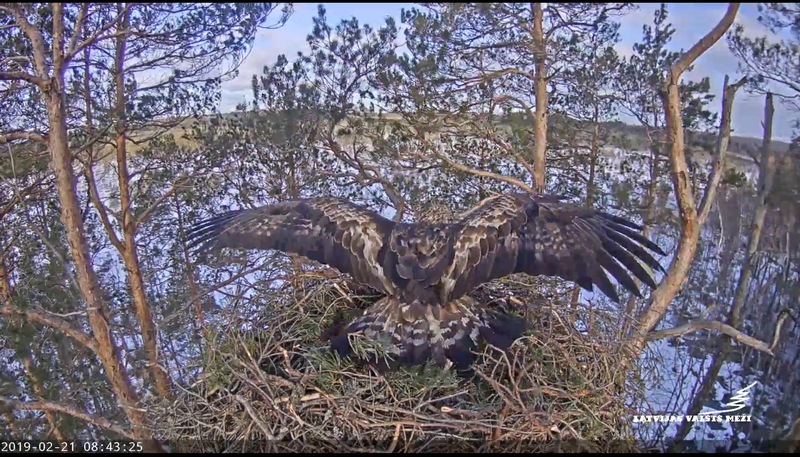 It is very important to preserve a wide variety of videos, as, like the small eagles, the film "Latvian State Forests" will form a rock eagle. Pesällä taisteltiin kahden oksan kanssa.